As part of my radio show, I have a special segment called “Talk Tuesdays” where I sit down and talk with an interesting individual–who is either a politician, educator, entrepreneur, or lawyer. 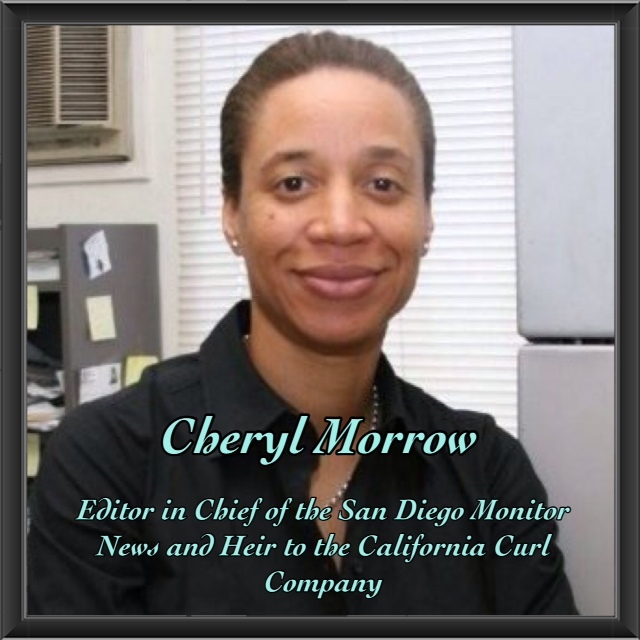 And on this special segment, I invited Cheryl Morrow, Editor in Chief of the San Diego Monitor News and Heir to the California Curl company, to share her personal insight as a woman entrepreneur and hair scientist. Having more than twenty years of experience as a woman entrepreneur, she has successfully branded herself in hair consultation and journalism–two fields which she says are still dominated by men. Cheryl Morrow is not just a personal friend but a mentor, which she was kind enough to share, in my interview, one great piece of advice on being successful: To be an “Intra-preneur,” instead of an Entrepreneur. Today Cheryl Morrow lives in San Diego, Ca, where she is working to launch a Hair Academy (to focus on Afro Curly hair) and a Black Hair Museum this Summer! These projects are an extension of her heir company, the California Curl company, where they develop new eco, bio, and safe beauty technology for the ethnic beauty industry–the only ethnic beauty company of its time. If you wish to contact Cheryl Morrow, for your next hair consultation and Ad in the San Diego Monitor Newspaper email her at beautewealth@yahoo.com.